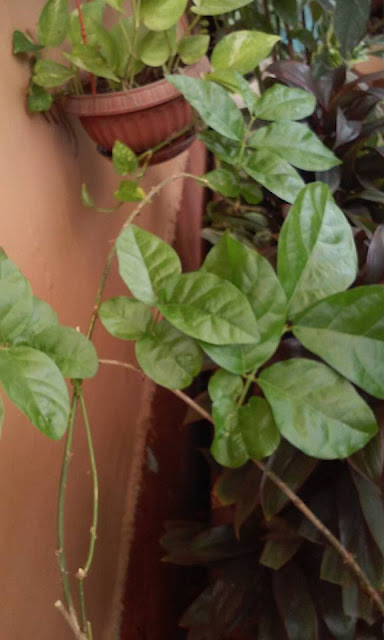 I was filled with awe seeing my potted Sampaguita plant almost dying. No, not again. 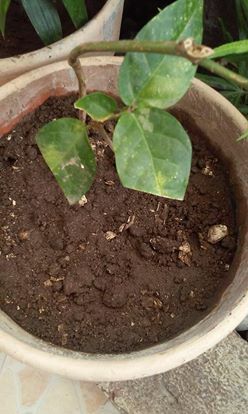 I guess this is the fifth time that I've repotted Sampaguita plant and as expected, leaves become dull and dry after a few weeks and there are some brown spots all over the leaves. I was challenged with this failure...I am a gardener wannabe and I will never give up. I've read a number of articles online and found out that coming up with your own organic fertilizer is not really that difficult. As a matter of fact, everything can just be picked up from your kitchen scraps. I've decided to give it a try. I've concocted my own mixture of organic fertilizer by mixing egg shells, banana peelings, vinegar and coffee grounds. I used a blender to thoroughly mixed all these ingredients, kept it in a jar overnight, then I started to use it with my newly repotted sampaguita plant. You will notice that it got more leaves now and the color of these leaves are bright green and looks shiny. I was really happy seeing this big change. This only shows that I was successful in my newly concocted organic fertilizer. My Sanpaguita plant now looks very healthy and as of this writing, it still continues to grow more leaves. To be honest, I intend to use this organic fertilizer for my upcoming vegetable garden since I want to make sure that I would successfully grow my long planned vegetable garden. This is indeed a challenge since, I am looking at container gardening and vertical gardening for my vegetables, so keeping them healthy is really a must. Now, I became even more determined to push through with my plan and I am going to start working on it very very soon.